To help with long term schedule planning (such as coordinating summer vacation times), ByteBloc allows providers to enter off requests up to five years in advance. Select the 'Provider' tab > 'Future off Requests' to access this screen. Future off Requests are transferred to the 'Shift Requests' screen when the associated request schedule is available. You will receive email notification of each and every 'Future off Requests'. Approve All: (Optional) The 'Approval All' button will approve all pending Future off Requests. If you want to approve the Future off Requests individually, select the 'Approve' or 'Deny' options within the 'Approval' column. If you 'Deny' a request, a 'Deny future off requests' window will display. The Provider name will be listed and the days will be checked off by default. You can add additional comment to the deny email per your preference. View List: Select the 'View List' button. 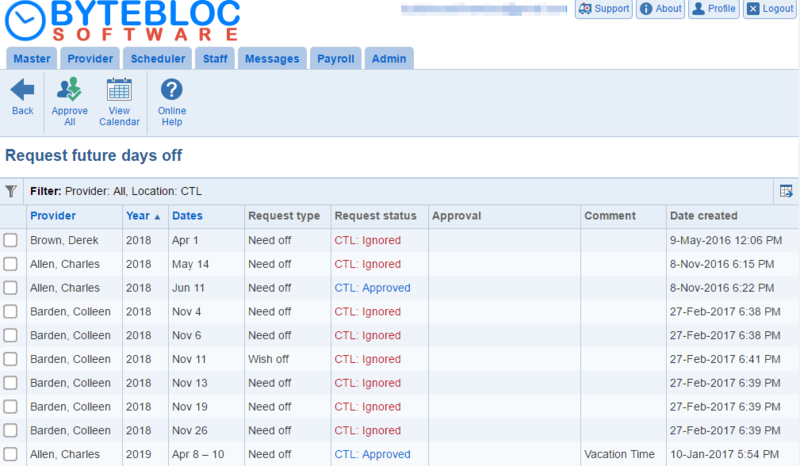 The 'Request days off' page displays all of your provider's requests. You have the ability to filter the requests by 'Location', 'Provider', 'Start date', 'End date', and 'Status'. It shows 'Provider', 'Year', 'Dates', 'Request type', 'Request status', 'Approval' (optional), 'Comment', and 'Date Created'. If you require approval for the Future Off Requests, you'll need to set this up in the 'Admin' tab > 'Edit Location' > Provider requests section. Provider: The 'Provider name' will be listed. Year: The request was made. You have the option to filter the years. Dates: An arrange of 'Dates' requested will be listed. Request type: It will usually be 'Need off' and 'Wish off'. Unless, the 'Off reason tracking' option is set up in the 'Admin' tab. Then, it will be 'Need off - Vacation', 'Need off - Admin', 'Need off - CME', and 'Need off - Personal', and the same for 'Wish off'. Request status: Displays the current status of the off requests. Approved - When the schedule administrator approves the request. The recipient will receive an email message that the request has been approved. Denied - When the schedule administrator denies the request. The recipient will receive an email message that the request has been denied with an optional comment. Ignored - Indicates a 'Draft' or 'As-scheduled' schedule was available without ever having a 'Requests' schedule accessible. Pending - When a request is made prior to the publication of any schedule and it hasn't been reviewed by the schedule administrator. Requested - When a request is made prior to the publication of any schedule and it doesn't need to be approved. Approval: (Optional) There will be 2 links listed 'Approve' or 'Deny'. Once, the request has been approved or denied this column will be empty. Comment: If the provider entered a comment it will be displayed in this column. Date Created: A time stamp of the date and time when the request was created will be displayed in this column. Note: 'Future off Requests' for prior schedules can be retrieved in the Future off Request 'View List' (tabular view). From the view, a report for the requests is available through the use of the table export tool. Approve All: Optional) The Approval All button will approve all pending Future off Requests. If you want to approve the Future off Requests individually, select the Approve or Deny options within the Approval column. If you Deny a request, a Deny future off requests window will display. The Provider name will be listed and the days will be checked off by default. You can add additional comment to the deny email per your preference. View Calendar: Select the 'View Calendar' button to enter in 'Future off Requests'. Note: The tooltip for the provider name in the future off calendar now includes the information that the request has been converted, if relevant. Month: Select the 'Month' from the drop down menu that's available to enter in days off. A pop up calendar will appear and you can select the month within the year or click the back or forward arrows to access the years (5 year period). If the 'Shift Requests' are available for the current month, you'll receive a warning, 'This calendar month has been locked to further entries for the location.' If you entered in 'Future off Requests' for that month it will inform you that your requests were transferred to the 'Shift Requests' screen within the 'Provider' tab. Future off Requests can be displayed to 16 months prior to the current month. Provider: Select the Provider's name from the drop down. If you want to choose a different providers click the 'X' next to the drop down and reselect another provider. Future off request comment: The pencil icon will display at the bottom of the day after entering in your request for that specific day. Enter your personal comment within the 'Future off request comment' window. There's also, an option to Copy the comment to days off adjacent to this day that are requested off, too. By default this option is checked off. Your comment will be visible to both you and your schedule administrator when the schedule is available in the 'Provider' tab > 'Shift Requests' screen. The comment will be highlighted in yellow. Optional: If required by your schedule administrator, you can make your 'Need off' requests for the day more specific by holding down the appropriate letter key before clicking the date; 'A' for admin, 'C' for CME, 'X' for personal, 'V' for vacation and click the menu at the same time. For example, to mark several days as 'Need off' (N + click) on the first day, then select the letter N + click on the last day you 'Need off'. Repeat steps to mark several days as 'Wish off'. You can remove an existing request by clicking on the menu and selecting the 'Available' (F + click) combination or clicking the option from the menu.